Introducing NVIDIA® CUDA & AMD APP technology, mediAvatar video converters and DVD rippers will accelerate the video encoding/decoding (especially high-definition video) by 5X on any PC with CUDA/AMD APP-enabled GPU built-in. 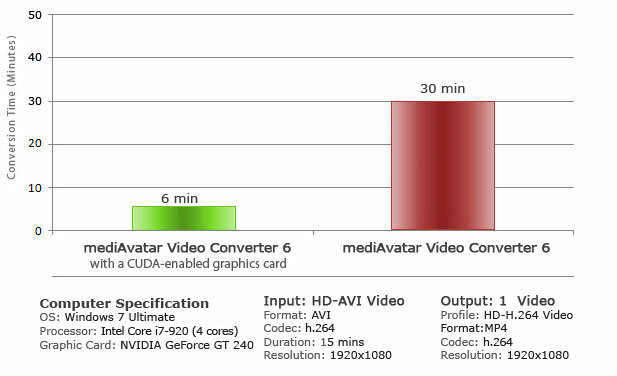 By shifting the DVD/video conversions to NVIDIA's GPU, more CPU resources can be spared for other applications, making your computer run much smoother. We have labeled all the conversion profiles that leverage CUDA & AMD APP technology, and offer you the option to enable GPU encoding/decoding acceleration once detecting CUDA/AMD APP-enabled graphics card on your computer. Here we would like to show you the improvement in performance when converting with and without CUDA using a diagram below.